The station environs at Altkloster is controlled by a variety of signals, some old semaphore types, and newer searchlight signals installed since WWII. I have set up working signals for visual effect, for persons viewing the layout, so they see the red, green or yellow aspects effectively. I don't see much point in installing working signals where no one is ever going to see them. 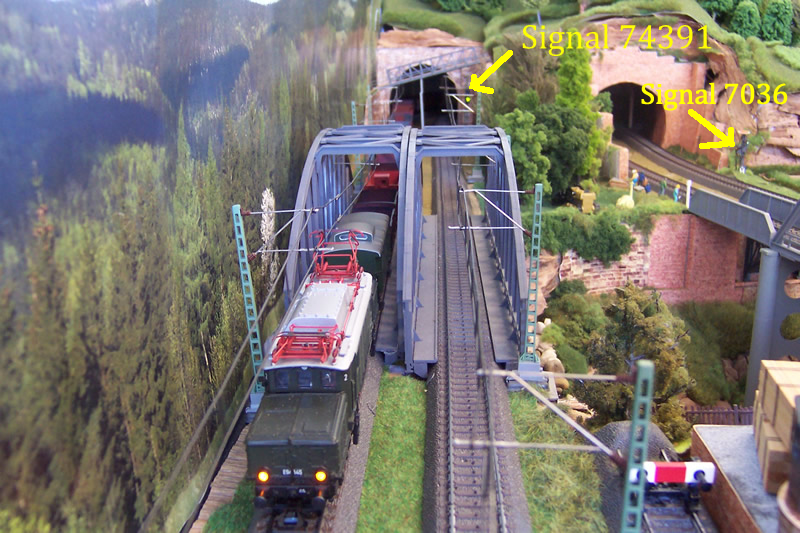 The signals are all Marklin, and actually control the trains. So a signal set at stop (red, Hp1), will stop an approaching train. 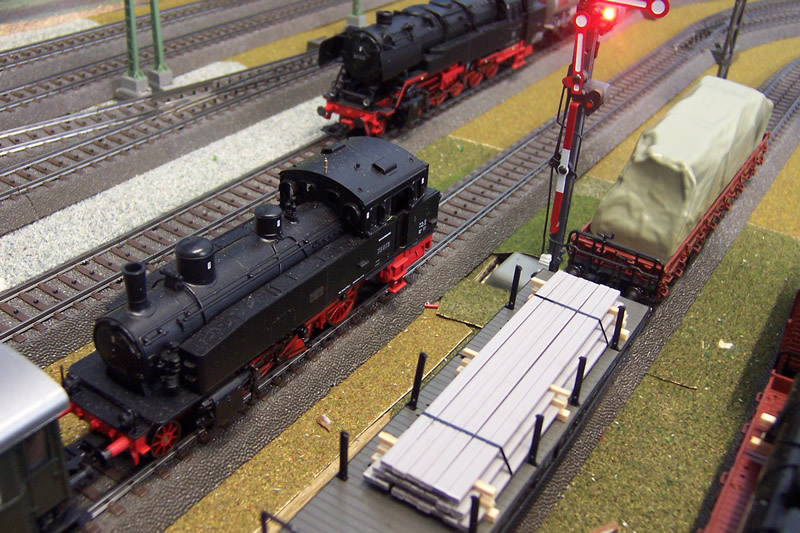 In this scene, a BR75 on a local train has been stopped at a red semaphore signal, alongside the freight wagon storage yard at the west entrance to Altkloster station. This signal, being at the entrance, shows either red for stop, or a green/yellow indicating the need to slow for a station approach. The Marklin 74391 acts as a block signal on the road to the east. It is showing green. If showing red, the train will stop, as the manual switch 72750 also controls power to the track. It is situated before a tunnel, so that engines can stop outside. An E94 is passing on the westbound track on an empty coal train heading back to the Saarfield coal mines. On the non-electrified track to the right can be seen the 7036 distant signal, which is simply a repeater for the home or block signal on the other side of the tunnel.